Our GuestCall® CommPass paging package is a powerful paging solution for guest waitlist management. With a brandable front display insert you can easily promote your businesses' services. The CommPass 20-slot charging tower saves space and charges pagers in 4 hours without overcharging — saving the battery life of your pagers. Need more than 10 pagers? The GuestCall® CommPass is high-quality, long-range guest pager with a place to display your business card or ad front and center. 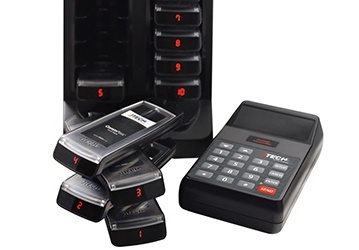 The GuestCall CommPass Charger holds up to 20 CommPass pagers and charges them fast. Your GuestCall® CommPass pager package includes everything you need to get going today! From transmitters to pagers, JTECH's quality is second to none.